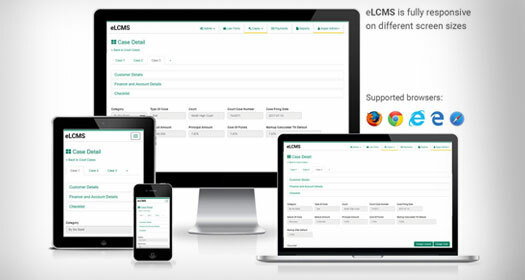 eTeam has a rich portfolio of Web Applications and Multimedia Products which include largest selling multimedia encyclopaedia on history of Pakistan with over 100K CDs in circulation since 1998.
helps you get decisions in favour of your bank. The latest version of this best-selling CD-ROM packs more information than ever with new and updated content. With over 200 articles, 600 photographs and maps, and 50 videos, Story of Pakistan 2003 is the most complete encyclopedia on the political history of Pakistan. So far, we have sold over 75,000 CDs of this product in retail as well as through corporate sponsorship. 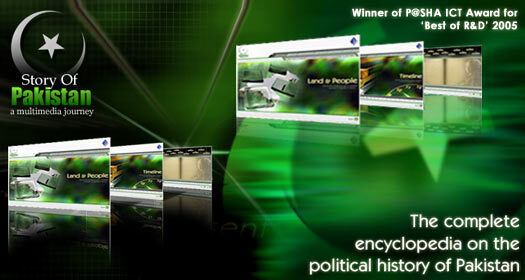 The Story of Pakistan CD-ROM is an exhilarating presentation of information about the political history of Pakistan. This interactive product presents the history of Pakistan, from prehistoric times till the present, in a manner keeping in tune with the demands of a modern audience. It uses the elements of creative graphics, pictures, era-relevant background music, video footage of key events, and narrative sound to package together a title which appeals to both the young and the old. It consists of the Storybook with over 45 minutes of self-narrative interactive documentary; the Timeline containing nearly 600 screens, 600 maps and photographs, and 50 videos; and Land & People covering geographical location, climate, economic indicators, demography and culture. The home screen follows an inspiring 3D intro. On the home screen, easy navigational buttons provide access to different sections. In addition to the main sections, the Glossary and the online version of Story of Pakistan are always accessible through the main button bar. The main slider at the bottom provides a direct jump to an era in history. Below the slider is the volume control. The main sections of Story of Pakistan are Timeline, Land & People, and the Storybook. The Timeline segment is divided into 12 eras, with a screen for each. Separate screens for events and personalities appear for each era, while each event or personality is represented by an icon on the screen. Selecting any of the icon links to the detail pages for that event or personality. The elements on the detail pages consist of text, maps, portraits, photographs, and video clippings. The text describes the event or personality in detail, with most articles spanning multiple pages. A Discuss button links to the article’s discussion forum on the Story of Pakistan web site. This section provides summary information about Pakistan. Key areas covered are geographical location, climate, economic indicators, demography, and culture. Information is conveyed mostly through maps, with legends describing the areas marked on the maps. This segment comprises of 40 minutes of narrative text on the history of Pakistan, spoken in a soft voice. As the narration progresses, the paragraph being spoken is highlighted on screen. The user can interactively select the paragraph to be spoken, or switch the sound off completely. Relevant graphics, pictures and maps appear on screen as the text progresses. Crescent Steel & Allied Products (2,000 CDs) etc. Referred by Stephen Cohen – Senior Fellow in the Foreign Policy Studies program at the Brooking Institution since 1998, and is an expert on India, Pakistan, and south Asian security issues. 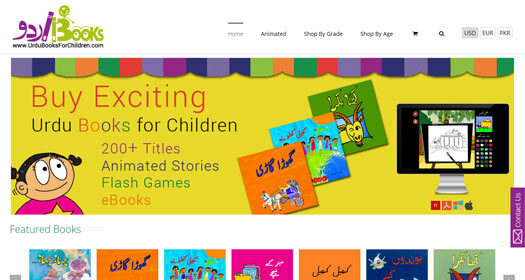 A unique eCommerce store for Urdu language only books for children published by The Bookgroup Karachi. 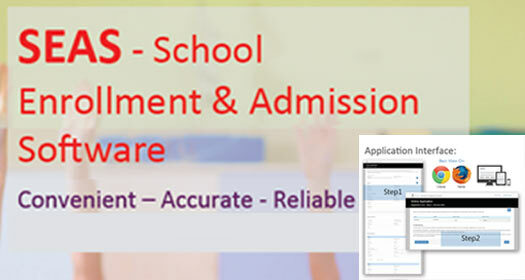 The books caters to all age groups and segregated class wise for easy selections. Majority of the books are part of school curriculum and maintain high standard of printing. The selection process for Bookgroup illustrations go through a lengthy due delligence process to ensure that they engage the child’s imagination while at the same time being suitable and culturally appropriate. Bookgroup books explore various concepts and themes that children enjoy learning about, while developing strong language skills and concepts. Bookgroup books have made a departure from conventional Urdu typesets to a modern font that is both aesthetically pleasing and easy to read. Several Bookgroup books have been written by students. Providing a child with guidance to write a book allows for a very interesting story, as seen by the child. Bookgroup books meet international standards for children’s books. All our titles are printed on high grammage paper in 4-colour with strict quality controls. World’s First Online Food Ordering & Social Networking Web Portal. KhaoPiyo.pk is a virtual place where friends and families meet, organize parties & treats and select best places to dine-in or order food online. Restaurants and home kitchens will interact with consumers using KhaoPeyo.com online ordering system to take delivery and take-away orders. In short KhaoPiyo.pk will be the first truly global social community where people and organizations will meet, socialize, discuss, buy and sell food products with complete freedom. KhaoPiyo.pk will provide a quick and convenient way to order food. Consumers can choose from a list of restaurants in their area, view complete online menus, and order food with just few clicks. KhaoPiyo.pk will calculate total bill, including applicable taxes and discounts, and automatically display orders to restaurant on their computer screens. Its Free Absolutely free to use. No hidden costs. Free memberships to consumers. Its Quick Find and sort through restaurants that deliver to your address. Its Accurate No more misunderstandings over the phone or outdated pricing on menus. Its Convenient No more fumbling for restaurant brochures, get the latest menu online. 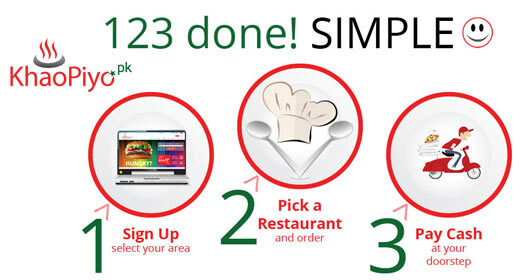 Simply pick a restaurant, and pick from the online menu. Its No Pressure Browse restaurant menus at your convenience; view bill total before placing order. Avoid waiting on hold for busy restaurants. Its Easy Bookmark your favorite restaurant, for easy access. Convenience to Customers Customers will always have your latest menus available, as close as their computer screens. Inexpensive Service KhaoPiyo.pk is very inexpensive, a very low charge on fixed rate will be paid by restaurants on each order delivered, received from the portal. Free Web Presence Listing your menu and restaurant information on the Internet for free. Free Online Support KhaoPiyo.pk will let restaurants manage customer support messages online. With complete history of orders and support tickets available for future references. Free Maintenance and Updates KhaoPiyo.pk will provide free maintenance and updates to all its partner restaurants during business hours. The portal will be hosted in USA on virtual dedicated servers managed under state-of-art hosting service with 24/7 customer support. This amazing interactive CD-ROM of the 99 names of Allah complete with the English translation contains 99 graphically illustrated screens and is auto-run as well as self navigational. 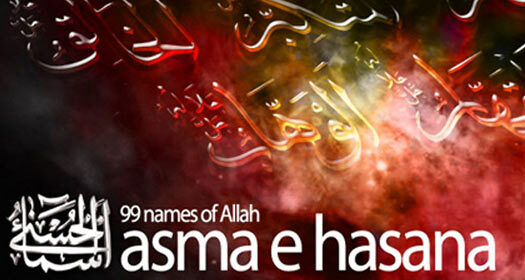 Self-run Animated Slideshow: A self-run animated slideshow, an interactive component and a screensaver of ‘Asma e Hasana’ with English translations. The self-run part is a sequence of artistically illustrated backgrounds, changing with smooth animated transitions and captivating background music. Interactive Slideshow: The CD-ROM also features an interactive slideshow, which allows a user to read ‘Asma e Hasana’, at his/her own pace while listening to soothing background music. Screensaver: The self-run animated slideshow of ‘Asma e Hasana’ has also been provided as a standard Windows screensaver. The screensaver gets initiated during periods of inactivity. With captivating music and graphics, it displays a smooth animated slideshow of the 99 Names of Allah. 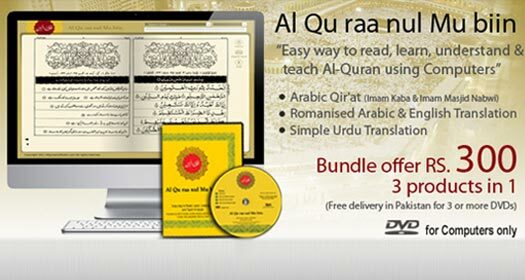 This beautiful interactive CD is a great help in learning the meanings of Allah’s Names. 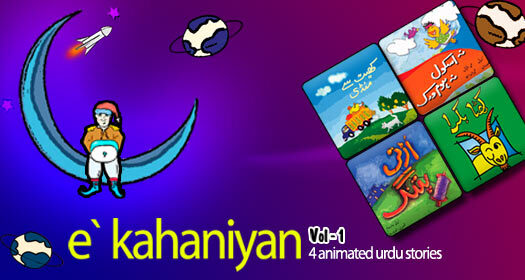 Cartoon Qaida is a fun-filled interactive animated multimedia tutorial of the Urdu alphabet. Specially designed for three to five year olds, the Qaida has enough colour and excitement to keep even the grown-ups glued to the screen, and enjoy the experience with their young ones. The main characters of the Qaida are a boy (Sami) and a girl (Saima) who take the children through the process of learning the Urdu alphabet. Each Urdu character is explained in a very friendly voice of the girl character, with naughty interruptions from the boy. Animated objects with fun sound effects represent words starting from each alphabet. As each object is clicked, the object animates itself to life, encouraging the children to explore on their own. 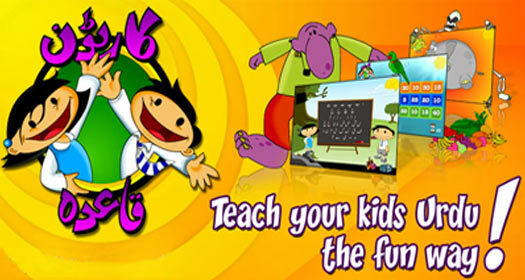 Cartoon Qaida makes a very effective and fun way for children to learn the Urdu alphabet, with adults also enjoying the show. All work and no play? Three engaging games are included to help the children learn while having fun, with the objective of getting them to familiarize themselves with the shapes and sounds of the Urdu alphabet. Included is an all-new original sing-along song which is already a hit with kids. Let them enjoy it and then hear them sing for weeks to come, and learn the Urdu alphabet the fun way. This new addition will let children express themselves by using colors on different images. Will help them learn color recognition and can be a way to de-stress, after a busy morning of school work, wind down, and calm down, after the stresses of a day at school or work…. Will develop hand-eye coordination to color in a coloring page using computer mouse. Focus is another “big lesson” that is learned from this game beside how to accept boundaries. In the end a sense of accomplishment, the first step towards a successful academic career for many children can be enforced through this e-Kahaniyan initiative. 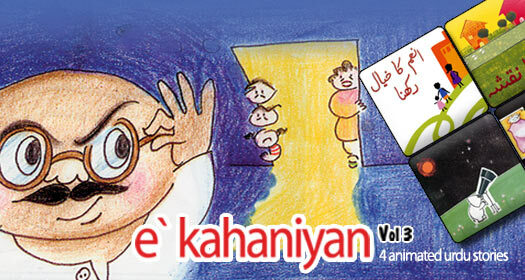 The first in a series of Urdu animated stories CD-ROMs, E Kahaniyan is a joint production of eTeam and The Book Group. 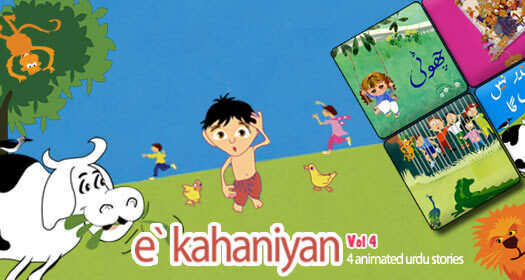 Accompanied with excellent background music, special sound effects, text, synchronized narration and animations, E Kahaniyan is first of its kind Urdu animated stories CD-ROM, targeted at school going-children. E-Kahaniyan Vol. 1 features 4 animated stories adapted from The Book Group storybooks. The attractive main menu of the CD-ROM contains links to the four animated stories. ‘Na School, Na Homework’ is a fun story about a girl who is fascinated by the carefree life of a sparrow and wishes to be one. She thinks that if she were a sparrow, she would have flown from tree to tree, branches to branches. She would have sat on a cow. Neither had her feet gotten dirty, nor she would have had to wear socks. ‘Khait Say Mandi’ takes children on a step-by-step journey of vegetables from fields to the market. It starts with telling how some vegetables taken out from inside the ground and some picked from plants and trees, above the ground. While describing each step of the vegetables’ journey, the story also highlights common elements of a village, like fields, tube well, cattle herds, flour mill, etc. ‘Khatta Bakrah’ is a humorous story of a goat that lived on a lemon tree. The story tells how the goat used to eat lemons of all types and sizes, day and night and sleep. The story then describes what happened when one day the goat encountered a hungry lion that used to sit under the tree. This story is about a kite and a boy named Meekael. In this story, the kite talks to Meekael and tells him about what it is viewing from the sky. Each story comes to life through animation of beautiful hand-painted illustrations with special sound effects and a soft voice narrating the story. Narrations add to the story-time effect. In each story, text is not only narrated but is also written on the screen, allowing children to be able to follow what’s being narrated. The previous/next buttons let children enjoy a story at their own pace. E-Kahaniyan Vol. 1 is an irresistible product for school going- children to help them learn about their surroundings in an engaging way, and to improve upon their Urdu while having fun. Accompanied with excellent background music, special sound effects, text, synchronized narration and animations, E-Kahaniyan Vol. 2 features four animated stories adapted from The BookGroup storybooks. The attractive main menu of the CD-ROM contains links to the four animated stories with options of auto play and page-by-page view. This is a funny story about a monkey who loves to fly. So two friends tie him with a kite and he experiences an interesting flight. Koi Baat Nahi is about believing that you can be any kind, colour, etc… but it does not matter. What matters that whatever you are you are special and should be proud of it! It is a child friendly informative book telling what special do the animals do with some of their body parts. This book is about explaining the concept of “Right” and “Left” among children. This book also explain different colours, shapes, expressions in Urdu language and relate them to “Paon” innovatively thus making all concepts clear in the mind of children. E-Kahaniyan Vol. 2 is an irresistible product for school going- children to help them learn about their surroundings in an engaging way, and to improve upon their Urdu while having fun. Accompanied with excellent background music, special sound effects, text, synchronized narration and animations, E-Kahaniyan Vol. 3 features four animated stories adapted from The BookGroup storybooks. The attractive main menu of the CD-ROM contains links to the four animated stories with options of auto play and page-by-page view. This book help children to learn to be responsible. The story is about a boy who is sent to do some important work by his parents but instead of doing things he got interested in playing with his friends. This is a story about a toddler who is left behind with elder siblings by her parents. This gives the message that we should take care of our younger siblings otherwise they can harm themselves. It is a funny story about far far far related aunt of few kids who is a very finicky woman and is always after the kids. The children are so fed up of her that they finally plan to scare her off and actually get stuck themselves in it. It is an informative book, about enormity of alot of things around us. This book provide concept of size, big, & small among the children. E-Kahaniyan Vol. 3 is an irresistible product for school going- children to help them learn about their surroundings in an engaging way, and to improve upon their Urdu while having fun. Accompanied with excellent background music, special sound effects, text, synchronized narration and animations, E-Kahaniyan Vol. 4 features four animated stories adapted from The BookGroup storybooks. The attractive main menu of the CD-ROM contains links to the four animated stories with options of auto play and page-by-page view. This is a story about a comparison between a human child and birth cycles for different animals. Very interesting fact which will help children to understand the natural phenomena of “Birth”. This is a story of a girl who is missing her friend whom she had a fight with and asked her not to come to her place again. She is swinging in her backyard and talking to her from across the wall but the friend is not replying. At the end it turns out that the friend is a cute cat. A combination of two stories written by students of a Govt. School. This story is about a young boy who is very naughty and bugs everyone. His mother scares him by saying that he will become a monkey if he keeps on doing all that. This book is about children visiting zoo. The story give the message that we should respect animals and should only observe them and should not disturb them in their cages. E-Kahaniyan Vol. 4 is an irresistible product for school going- children to help them learn about their surroundings in an engaging way, and to improve upon their Urdu while having fun. Tail Choppers commemorating the golden jubilee of the No. 14 Squadron, nicknamed “The Tail Choppers”, of the Pakistan Air Force. Made in collaboration with the Pakistan Air Force, this CD-ROM includes videos, interviews, paintings, photographs and text which cover the history of the squadron in full color detail. 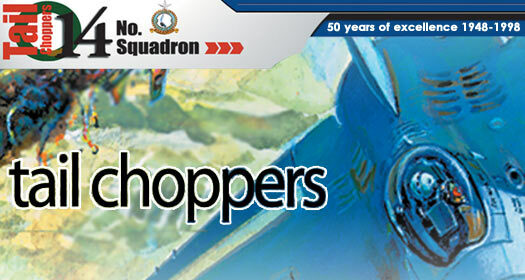 ‘Tail Choppers – 50 Years of Excellence’ was developed and launched in 1998 commemorating the golden jubilee of the No. 14 Squadron, nicknamed “The Tail Choppers”, of the Pakistan Air Force. Made in collaboration with the Pakistan Air Force, this interactive CD-ROM showcases a complete history of the No. 14 Squadron from the year 1948 to 1998. The ‘History’ section traces the history of the squadron through the year, with a descriptive historical background of Tail Choppers, a timeline covering major milestones and the highlights of the 50th Anniversary Celebrations of the squadron. The ‘Historic Milestones’ timeline features many photographs, illustrations, interviews, as well as actual video clips showing the flights and raids in real time as they happened, providing fuller explanations of events of each period in the timeline. Interviews of key figures have been included, narrating the account of their encounters with the enemies. ‘The 50th Anniversary Celebrations’ covers the highlights of the event, group photographs of the squadron, and the addresses (video clips) by the Air Vice Marshal – (Retd.) Dilawar Hussain and Air Vice Marshal – (Retd.) Khyber Khan. The ‘Personnel’ section contains the details of martyrs and Gallantry Award winners of 1965 and 1971 wars. Other significant personalities include Squadron Commanders who added a new chapter of courage and honor to the Pakistan Air Force history. The caricatures on ‘The Lighter Side’ page give an interesting touch to the CD-ROM. The Aircraft section provides an insight into the fascinating history of the aircraft through the years (1948-1998). The history of the aircraft has been broken into periodic sections over a timeline. All the aircrafts have been showcased through photographs, textual descriptions, illustrations and video clips of live flights or raids as they occurred. Some of the aircraft included in this section are Harvard, the first training aircraft of Pakistan (1948), F-865 (1956), F-16 (1986), F-7p (1998) etc. This section contains a total of 11 videos clips of aircraft. ‘Crest & Color’ provides explanations of the squadron symbols/badges, the squadron motto and its translation. The ‘Tail Choppers’ CD-ROM effectively uses the components of multimedia, i.e. live footage, interviews, text, photographs, illustrations and audio, to take the viewer on a captivating journey through the history of the No. 14 Squadron, in full-color detail. A multimedia century of Cricket? Got to be something interesting… It is! Play Snakes & Ladders of Pakistan Cricket and be a part of history by notching a multimedia century of cricket. 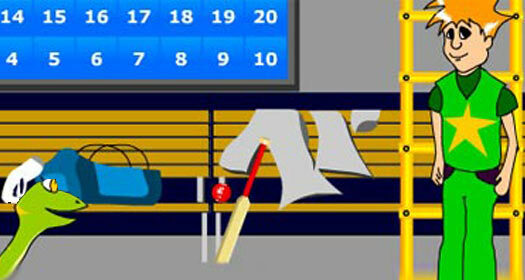 Snakes and Ladders is a game based on a trivia concerning Pakistan Cricket. Once on the game screen, the player just rolls the dice by clicking on it. The dice displays a random number between 1 to 6. If the player gives a correct answer to the question asked, there is an increment in his position by the number displaying on the dice. If a bonus square is reached, increments or decrements are multiplied by the number displaying on the dice. The bonus squares are randomly picked and do not appear more than 5 times. So if you want to know how much or how little you know about Pakistan Cricket – This is the right product to challenge your knowledge!